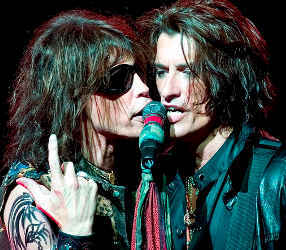 Early 2011 the band Aerosmith plan to start the studio working on new album. Unfortunately up to now they still look for the presence of the guitarist Joe Perry. "We're having trouble finding Joe. I do not know where he is, but try to go to Los Angeles in late January. I havehave a lot of time there ,"says the vocalist Steven Tyler while talking with Rolling Stone ,told Spinner , Tuesday ( 11 / 1 / 2011). Steven has managed to collect any other personnel, including the drummer Joey Kramer. Joey is very eager to make old-school album for Aerosmith. Now Steven was eager to continue Aerosmith. Whereas previously claimed to want to leave from Aerosmith and wanted to try to fill the position of vocals on the band Led Zeppelin. Several years ago Steve and Joe are planning went into the studio to work on a new album. However, due to internal problems it failed to be realized. Although conflicts happen, Steven claims that he and Joe are brothers forever. Now that time has passed. Steven wanted Joe back. "I just need to unite them all together and unify them into a band. That's it,"explained Steven.